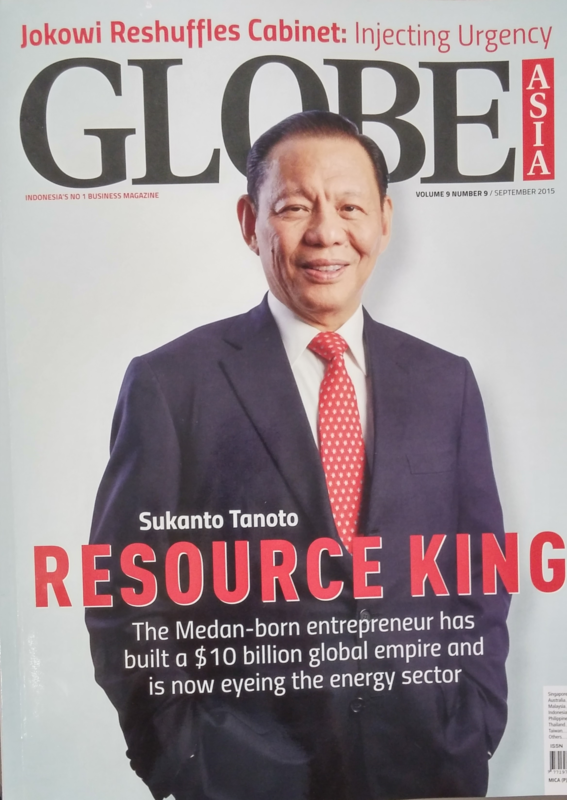 RGE founder and Chairman Sukanto Tanoto was featured in the September issue of GlobeAsia (pages 34-38). The below article is shared with permission from GlobeAsia. Natural resource-based manufacturing has catapulted Sukanto Tanoto to a position as a major global player in palm oil as well as pulp & paper. 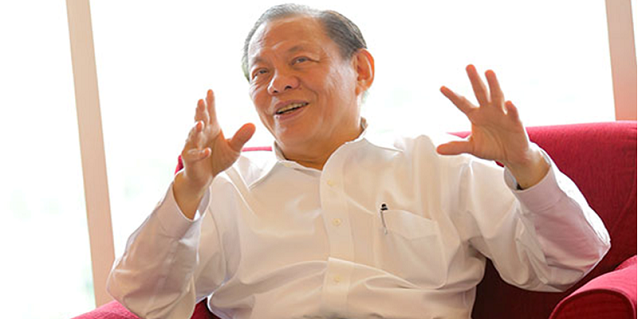 Now the 66-year-old Medan-born entrepreneur is focusing his sights on energy and tackling the industry with the same zeal. Sukanto Tanoto still has big dreams. Over the past 48 years, starting in his native Medan, he has built a global business empire stretching from Asia to Latin America, Europe and North America. Now 66, he has brought his children into the family business but he has not lost the hunger to grow nor to stop dreaming. Even as he continues to expand his pulp & paper and palm oil operations, he is eyeing new business opportunities. In a rare interview, he spoke to GlobeAsia at his sprawling $6 billion (Rp80 trillion) production facility in Kerinci, Riau, the jewel in the crown of Royal Golden Eagle (RGE). He has had his controversies and his battles, including a disagreement on his tax liabilities, but they have not slowed him down. And after years of battling with conservationist, Asia Pacific Resources International or APRIL, the company that manages the Kerinci plant, received cautious praise from environmental groups after announcing a new sustainable policy. The company announced that it would halt the harvesting of all natural forests for its pulp mills. Greenpeace and the World Wide Fund for Nature both welcomed the pledge and said they would be watching the implementation of the policy carefully. The updated policy also adds high carbon stock (HCS) assessment to current conservation commitments. HCS applies to any forest area more robust than shrubland. Business and life move on. Sukanto is adjusting to the new global economic environment and looking for new opportunities. His latest venture is a liquefied natural gas (LNG) project in Canada which he hopes to get up and running within three years. Does the new somber business climate worry him? Historically low energy prices are both a blessing and a concern to business. The shale gas revolution in the US has driven oil prices to below S50 a barrel and affected new investments in the sector. The oil industry’s pain, however, is the global consumer’s windfall. “This low energy price has put a lot of money into consumer hands,” says Sukanto. With 90 million barrels of oil transacted globally per day, even at $60 per barrel consumers were saving $4.5 billion a day compared to a year ago. “That is like a stimulus to consumption,” he notes. “Look at America where everyone is driving big cars, the consumer is saving a lot of money on his energy bill and using the money to spend.” Such spending is fuelling the US economy, which is likely to grow by over 2% over the next three years. Companies will have to adjust and realign their businesses to this new reality. For RGE, it means looking for new opportunities within its core businesses, which remain focused on resource-based manufacturing. With total revenue of over $10 billion annually, RGE plays among the industry’s big boys. “We are the second largest pulp mill in the world, we have the largest viscose plant in China and in palm oil we are among the five largest exporters in Indonesia,” he states. Apart from energy, he is looking to penetrate new segments of the paper market. 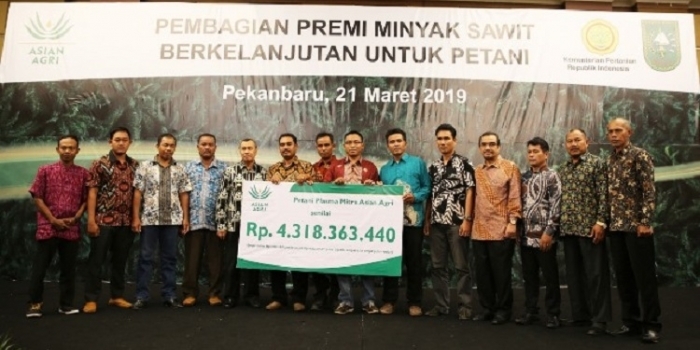 The paper mill in Kerinci currently produces 840,000 tons of paper and Sukanto is adding a $2 billion third production line which will add an additional 250,000 tons. The second product line, specialty cellulose, will be produced by Sateri, another subsidiary which also has operations in China. Specialty cellulose is used in textiles such as rayon and non-woven products such as baby wipes and personal hygiene products. The plant, he adds, aims for zero defects in order to meet the needs of Japanese buyers. It is this desire that is helping RGE to conquer new markets for its paper products, such as digital printing paper. Film is a very good example of how industries can change. In 2008, Polaroid discontinued instant film, a product that was deemed obsolete in the digital age. But thanks to some persistent fans and new technology, Polaroid has been reborn. Film is now used by both recreational photographers as well as professional shooters when printing their pictures. Sukanto saw this trend and today RGE sells $500 million a year worth of chemical fiber for special uses to Eastman Kodak. “They are not dying. They are a $17-billion market cap company,” he says of Kodak Eastman. “The challenge is to re-invent yourself and even Microsoft is doing it,” he notes. 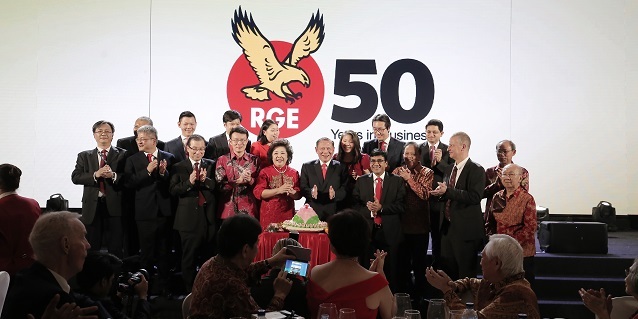 Apart from the Kerinci plant, RGE also owns a similar production complex in China which supplies markets in Europe and Africa. In Brazil, RGE operates 160,000 hectares of plantation to feed its pulp & paper mill, which supplies the North American market. Over the past 48 years, Sukanto has built a global business empire. In both pulp & paper as well as palm oil, he is a top five global player. “I started with nothing, from the floor. I never thought that one day I would have a business that is global but I always dreamed of doing something better, bigger,” he says. Not many Indonesian or indeed Asian entrepreneurs would pursue such ventures in these challenging times. But Sukanto just cannot resist a good challenge. “We are starting this project at a time when energy prices are low,” he says. So why start now? “Life is like this. When I started business 48 years ago as a contractor, I was only looking to survive, cari makan,” he says, using the Indonesian expression to look for food. With a successful contracting business under his belt, he started looking for other opportunities and entered the plywood business in the mid-1970s. While on a trip to Malaysia, he chanced on palm oil. He started his pulp & paper business with the same thought process. On a visit to Finland, he discovered that the Finns took 60 years to grow trees and were still competitive while similar trees took only five years to reach the same height in Indonesia due to climate and soil conditions. 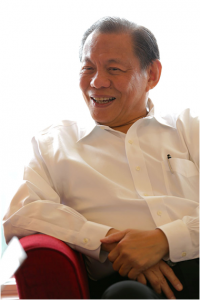 While he has no plans to retire anytime soon, Sukanto does have one eye on ensuring the future leadership for the group. He is grooming his children to take over at some time in the future “I started succession planning 10 years ago but my wife started 20 years ago so I am very fortunate to have her,” he notes. Instead of touring Europe or visiting the US, the Tanoto children spent their school holidays visiting the production facilities in Kerinci. “When they were in elementary and secondary school, we spent one to two weeks in the factory. Now they are familiar with this environment so it easier for them now,” he says. All four children were given a first-class university education and encouraged to work for global firms before returning home. His two daughters spent time with Citi Group and Morgan Stanley respectively while youngest son Anderson also spent time in New York. Eldest son Andre runs his own investment and trading business, while the other three work in the family business with one daughter managing the Tanoto Foundation. “I believe first you have to give them opportunity, stimulate and develop their potential. If they want to work and their heart is in it, they will do a fantastic job,” said Sukanto, describing his philosophy towards his children. With his children learning the ropes, Sukanto is focusing on the long term, for a time when he will have left the stage. “I want sustainability. There is still a lot to do and I cannot do everything. My main job is to sustain the company and make sure it’s good for the country,” he states. “I have been working for 48 years. Now I want to do something I like such as traveling and learning something new,” he adds. This is why he spends time at Wharton Business School and is among its patrons. Even as he sits back slightly, the competitive streak gets the better of him and he can’t help but lean forward again to talk about his next big challenge, getting the Canadian LNG venture up and running. “When in life do you get a chance to compete with the likes of Shell, Chevron, BP?” he says, referring to the global oil giants. 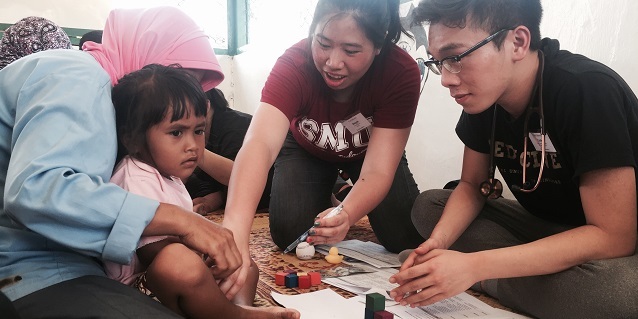 The young man scratching a living in Medan nearly half a century ago is now a major global entrepreneur. Sukanto never finished school but today employs nearly 100,000 people across the world. He is paving the path for his children to follow him but is still very much in the driver’s seat. It is clear that the fire is still burning bright. The above article was written by Shoeb Kagda, for GlobeAsia. You may view the copy of the above article here. The investment to add the third production line at the Kerinci plant is USD 300million, not USD 2billion as mentioned in the article. Additional information to the USD 10billion revenue of the company, we would like to note that USD 4billion comes from the Indonesian operations. The Group’s total asset is amounting to USD 15billion, instead of USD 10billion as stated in the article. Furthermore, the RGE plant in China does not supply to Europe and Africa, while the Brazil plant does not supply to the North American market. Anderson Tanoto, while he did spend time in the US, he did not stay in New York.